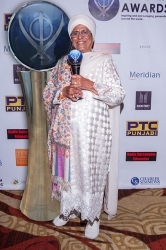 Bhai Sahiba Bibiji Inderjit Kaur Khalsa, PhD, was honored with the Sikhs In Education Award at the eighth annual Sikh Awards 2017, which took place at the Fairmont Royal York Hotel, Toronto. This award is bestowed to any Sikh educational establishment, teacher or individual that is taking a strategic approach to recognizing, educating and developing the talent and skills within the community. Espanola, NM, October 30, 2017 --(PR.com)-- Bhai Sahiba Bibiji Inderjit Kaur Khalsa, PhD, was honored with the Sikhs In Education Award at the eighth annual Sikh Awards 2017. The Sikh Awards recognizes the pivotal contributions made by the Sikh community across a variety of fields, from business, charity, education, entertainment, professional services, selfless service and sport, with winners selected across the globe from Asia, USA, Canada, Australia, Europe, Africa and the Middle East. Panth Rattan Bhai Sahiba Bibiji Inderjit Kaur, PHD is the Chief Religious Minister of Sikh Dharma International and the wife of late Yogi Bhajan. Thousands of students’ lives around the world have been changed by the lifelong work and mission of Bibiji and Yogi Bhajan to spread the Guru’s teachings. Many of their students have started practicing the Sikh faith and these new western Sikhs have built Gurudwaras, throughout the U.S.A. and other countries. Bibiji‘s outstanding work for humanity has brought recognition globally. She was given the title of Bhai Sahiba by the Sri Akal Takhat Sahib in 2004, the Jewel of the Nation in 2005, Ambassador of Peace in 2006, the Pride of India award in 2007, named the Governor’s Representative to India in 2007 and the Jewel of the Punjab in 2017. There are many students from diverse countries who study at the Miri Piri Academy, a boarding school they founded in Amritsar. Bibiji is the founder of Create Inner Peace and has authored numerous of books on Sikh education. Karen Johnson-Basra, who currently serves as a weather anchor/reporter for CBC Toronto and CBC Windsor, hosted the event. This prestigious event saw over 500 guests in attendance from elite international dignitaries to public figures, community heroes, sports stars and celebrities. Esteemed guests at the event included Minister Badish Kaur Chagger, Patrick Brown, Maxime Bernier, Randeep Sarai, Adrienne Batra, Peter MacKay, Bob Saroya, Dr. Ruby Dhalla and David Mirvish.